Disney’s Animal Kingdom Lodge is home to a number of safari elements for those willing to brush past the initial veneer of what is found in the lobby, pool, restaurants, and main guest area. There are animals present for photo safaris, cultural icons, a look at historical travel to the continent, and folklore, all waiting to be discovered. Aside from the animals, however, there may be no greater abundance in the resort than the artwork that can literally be found around every corner. 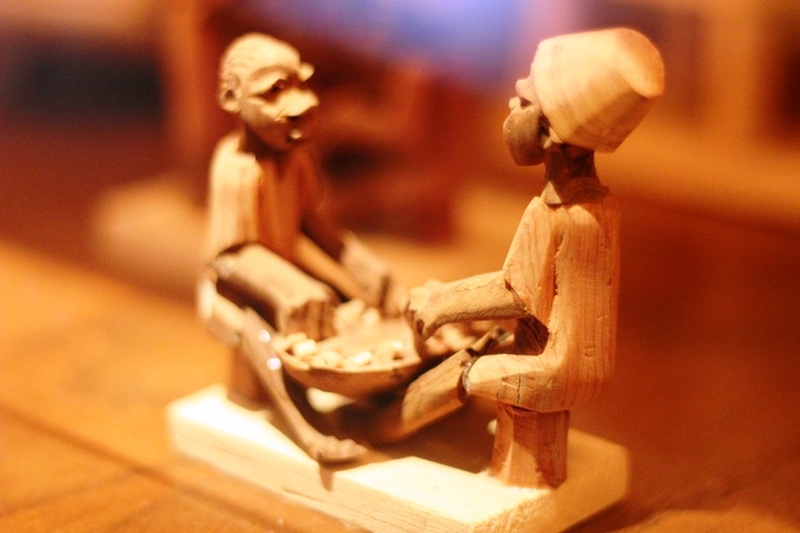 For those uninterested in touring the entirety of the lodge, the Sunset Overlook offers a wonderfully cultivated assortment of art, history, and photographs, including a selection of carvings from the Yoruba people. The Yoruba people live in a multitude of countries, but the densest collection of Yoruba individuals live in Nigeria, where they make up no less than 21% of the population. The Yoruba people are some of the finest artisans in Africa, and are known for their ornate carvings on all variety of surfaces, metal work, beaded crowns and other beadwork, and theatrical arts. In spite of this wealth of skill and mediums, what can be found in the Sunset Overlook is known as thorn carving, or thornwood carving. Thorn carvings began around the 1930s in Nigeria and are commonly referred to as “tourist art,” as they began to come into the commonplace during the influx of travelers and explorers that made their way to the country. These visitors would want small tokens of their travels to take home with them. A majority of these carvings capture everyday activities, such as chores or leisurely endeavors. The two examples here feature men rowing a boat and two people engaged in a game, meal, or chore of some sort. They thorn carvings exist on the fringe of Yoruba artwork, not because they are cheap or looked down upon, but more so because they are taken on by serious artist to show the lighter side of life, almost like a way to occupy their time between larger projects. 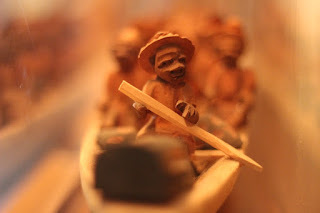 Typically, the wood utilized to make these comes from the ata or ogungun trees, with thorns that can reach upwards of five inches long, with an elasticity that makes for easier carving. It is the miniature size of these artifacts that makes whatever details they can be imbued with so incredible. In fact, when you look at the figures, and the proportions the artists had to work with, the only way to identify the mouth, nose, eyes, ears, and other facial features is either through bumps or tiny dots, and any expression of feeling is going to come more from body language or the scene itself rather than the minimal facial features. There are a vast number of art forms to be found all through the Animal Kingdom Lodge, many of which are unfamiliar or that are created with materials that are not common to guests. For a brief introduction to all that awaits throughout the lodge, the Sunset Overlook is the place to visit. Most of the day, the overlook is quiet, save for the occasional family on their way to the balcony on their own photo safari. I for one, love exploring the shelves and cases and seeing what artistic work I can learn more about!